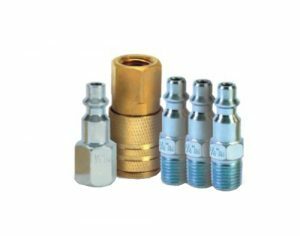 This efficient mix of professional quality steel fittings, brass couplers, and accessories allows you to stock the optimal assortment for your customers. This program, with both carded and bulk SKUs, provides the perfect add-on sales opportunity for your Grip-Rite or any other branded pneumatic products. Trust Grip-Rite for the finest pneumatic accessories. Plugs are heat treated to help eliminate failure at critical wear points. Professionals prefer steel construction plugs due to their superior wear resistance and longer life. Couplers have stainless steel ball bearings to ensure a secure connection. 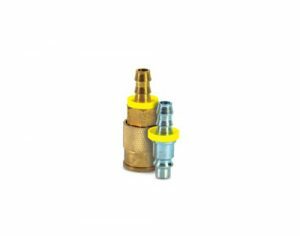 Professionals prefer solid brass couplers due to their non-sparking attributes and higher corrosion resistance. 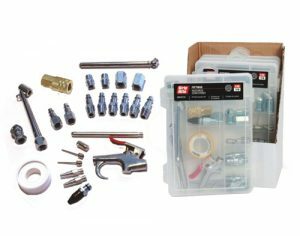 Grip-Rite's comprehensive assortment of pneumatic accessories can be merchandised a number of different ways to best fit your customer's needs. Ask about possible display options available.